Inflatable Kayaks Sale. Save 50% on ALL Inflatable Kayaks. Why inflatable kayaks? Inflatable kayak deflates to the size of a piece of airline luggage, and can be stored virtually anywhere. Inflated in only minutes, you will find inflatable kayak to be a full sized source of fun and adventure. Saturn iSUPs are not only great for stand up paddling, but also work excellent as Sit-On-Top Inflatable Kayaks. All Saturn iSUP boards comes with set of D-rings that can accommodate 1 or 2 optional kayak seats. 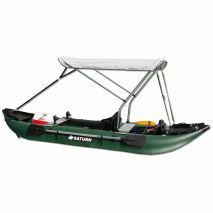 Saturn 12' iSUPs are suitable for 2 adults, and 11' iSUPs are suitable for 1 adult or 2 kids. Saturn 14' long self-bailing Ocean Inflatable Kayaks were designed for situations when kayaks can be flooded with ocean waves. Water will quickly escape through holes along kayak floor. Saturn ocean inflatable kayaks comes with 2 removable fins for improved tracking in a wind. Kayak is long and can take up to 3 persons or large load of gear. Saturn's line of commercial grade, heavy-duty Expedition Inflatable Kayaks are ready for wilderness exploration anywhere your adventures take you. Portable and lightweight, they are made of extra heavy-duty 1100 denier PVC fabric. These kayaks will easily beat any competition, not only in the price arena, but also in durability and quality. Easy to carry and portable to store, these kayaks are a great addition for RV, campground, and fishing trips where a vessel's portability is important. 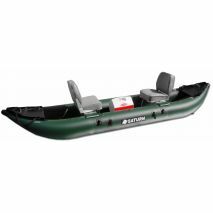 Pro-Angler Fishing Inflatable Kayaks are made of heavy-duty 1100 denier PVC. The floor is made of a 10psi high-pressure drop-stitch air deck fabric that is extremely rigid when inflated, but can be rolled up when deflated. Additionally, a double layer of PVC fabric is glued to the air floor and on top of kayak tubes for extra durability. Super-rigid, high buoyancy tubes make Saturn FK396 kayaks so stable, that you can easily stand and fish from these inflatable kayaks. Pro-Angler Ocean Fishing Inflatable Kayaks are based on our popular Pro-Angler fishing inflatable kayak, but designed to be used in an ocean waves. It has 2 slits on both sides of air floor, to let water escape when kayak hull is flooded with waves. Ocean fishing kayak version also has 2 removable large fins for superior directional stability in a wind. High pressure air floor of ocean kayak is glued between tubes, instead of resting on a bottom fabric layer glued to the bottom of regular kayak tubes. Saturn motorized inflatable kayak - KaBoat, will fit into medium size bag, so that you can go on a road trip, vacation or camping, and take motorized inflatable kayak KaBoat with you. You can paddle KaBoat, row it, or use small outboard motor. KaBoats are very stable, and you will feel comfortable standing and casting, yet be agile enough to get to the trickiest spots where other regular boats have no chance to go.